Eight years ago, Scottsdale sculptor Bonnie Radow shifted her focus to jewelry design to enthusiastic acclaim. Her heirloom quality creations in silver, gold and precious gems are distinguished by Victorian and antique Asian artifacts from around the world and the compelling stories behind them. Her collection includes charm-laden storybook necklaces; big, bold silver cuffs with embedded Buddhas; delicate ruby bracelets; and a contemporary twist on a traditional charm bracelet. 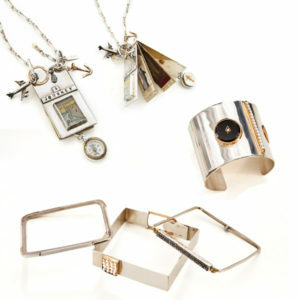 Bonnie’s pieces subtly complement each other and are intended to be worn together. 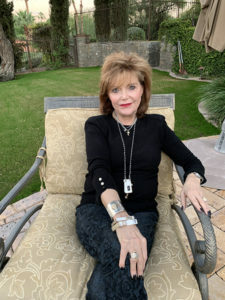 Every piece in the collection is designed and created by Bonnie in her Paradise Valley studio overlooking Camelback Mountain and each individual piece incorporated in each design is either antique or custom made, including all charms and chains. Utilizing 16, 18, 20, & 22 gauge metals, the pieces are solid and sturdy and extremely comfortable to wear. If you are interested in purchasing a one-of-a-kind Bonnie Radow Designs jewelry item please see our inventory and pricing under the Collections tab. Additionally, Bonnie often creates custom storybook necklaces for clients who own antique artifacts or who have their own story to tell. If interested in a custom necklace, contact Bonnie at bonnieradow@cox.net.